The unique Saltwater Reading Cards revolve specifically around the saltwater flora and fauna life of Indigenous Australia. The deck was created by Laura Bowen and is published by Rockpool Publishing. The deck and book come housed in a lovely, sturdy outer box that opens magnetically. There is a cardboard insert that holds the card, but I have removed mine, because it is easier to access the cards without it. There are 36 cards in the deck, measuring "3.75" x 5.5". They are quite large but easy enough to shuffle due to their flexible card stock. They have a very glossy finish. The backs feature a blue and white fish design which isn't reversible, but difficult to tell which end is up. There is a large light blue border around the cards, with a subtle dotted design. Within the border is the card number and name (on top) and a keyword (on bottom). The artwork in this deck is so unique and refreshing. The majority of the surfaces of the artwork are comprised of dots. The colors are so bold and vibrant, it is a joy to just look at the cards. Despite the very specific area this deck covers, there is great variety in the characters in the cards. There are birds, fish, shells, mammals, reptiles, invertebrates, habitats, and more. I love the cards like Tides and Rough Seas, because they add an even wider reach to the deck. Visually, my favorite cards are Shark, Tides, Jellyfish, Dugong and Manta Ray. My favorite animal is the manatee, and I have several decks that feature dugongs, to which I always say to myself, "close enough"! My first reading with this deck was a single card, but incredibly poignant. I had found out that day that the hospice patient I was caring for had passed away the day before, just hours after I had left him. I was very sad and wished I had been there for his passing. I drew the Sea Shells card soon after hearing the news. From the book: "Sea Shells were all once home to the different sea creatures that lived inside them. Once the creatures have moved on, outgrown or been eaten, their shell will make its way to rest, empty upon the sand, carried there by the waves." I couldn't help but see the metaphor of this man's shell, his human body, being left behind when he was done with it, as he returned to spirit. The card is meant to be about inner guidance, but it had a distinctly different, very specific and special meaning for me that day. The next day, I drew Shark, my favorite card, visually, in the deck. It was a kick in the pants for me, telling me to do what needs to be done before someone else takes the reins. Take charge while I can still control the outcome. Eat or be eaten, baby. I drew the beautiful Tides card one day. I had once tried tracking my moods and energy levels with the cycles of the moon for a few months, but it only proved that I am unpredictable and not at the mercy of the moon or my menstrual cycle, as no patterns emerged. So when I pulled this card, I decided instead to zoom out and see if my moods flowed more on a seasonal cycle. I definitely harbor ill will toward summer and have a life-long love affair with Autumn. But it interested me to see if my moods and energy levels are decidedly different when each season rolled around. Perhaps I can be predictable four times a year, if I can't be pinned down on a weekly/monthly basis. It was food for thought. One day Seahorse flew out of the deck when I was shuffling. Family time with my kids is the best. We were playing a game that day, laughing so hard that I cried. Love that! This card nailed the dynamic that day. Two days in a row, I drew Starfish. The card is about symbols and synchronicities, so it was fitting that the card itself would come up more than once! At that time, my stalker symbols were volcanoes and peacocks. The Starfish made me pay more attention to what those symbols might mean for me at that point in my life. The next day I drew Rockpool, which indicates healing saltwater. It was time for an Epsom bath or a pink Himalayan salt bath to relieve my pent-up stress and to release negativity. I love when cards point me in the direction of actual, physical steps to take to better my well being. I've had Sea Anenomes come up telling me to create safe boundaries during a time when I was being pushed around by immature drama. I've received the Sea Sponges card several times when I am emotionally overwhelmed, advising me to let my feelings come and go rather than holding on to them, and reminding me not to absorb others' emotions. This card encourages us to feel all of our feels and then let them pass on through, keeping only what nourishes us. Laugh hard and cry hard. Kids do this naturally. The message of this card reminds me of The Sedona Method. The cards are so comforting, so wise. They give you what you need to hear on any given day in such a kind and gentle way. I turn to this deck when I want to be given advice that I know will help me feel better right away. The 96-page book is really beautiful. It measures 4.75" x 7.25". The pages are thick and smooth and the images are in full color. The book begins with a Table of Contents. There is an Introduction which discusses the Australian saltwater environment. Next is a section on how to use the cards, including three spreads (One Card Enquiry, a 3-card Sun Cycle Card Reading, and a 5-card New Horizons Card Reading). The next section is titled Working with Saltwater. It's a lovely two pages on many different ways to work with the energy of saltwater. The rest of the book is dedicated to the card meanings. The cards are listed in alphabetical order. On the left side is a full-page, full-color, life-size image of the card. On the right side is the card meaning, given in a generous several paragraphs. First you are given a little information on the card subject (whether it be an animal, shell, habitat, etc.) which I really appreciate. Then you are shown what the card means for you in your life and how you can use the information for healing, empowerment, etc. It's a really lovely and helpful book that compliments the deck wonderfully. This is a very gentle deck that has an easy-going flow to it, very fitting to the watery theme. It would be the perfect deck to bring to the beach, of course, and has a summery vibe to me, but can obviously be used year round, perhaps especially for those in winter who yearn for a taste of summer. Being a water themed deck, it is also a good choice for sensitive or emotional readings. The deck feels relaxing and healing like a warm salt bath. It is now the first deck I think of when I feel out of sorts or sad, and need comfort and emotional healing. 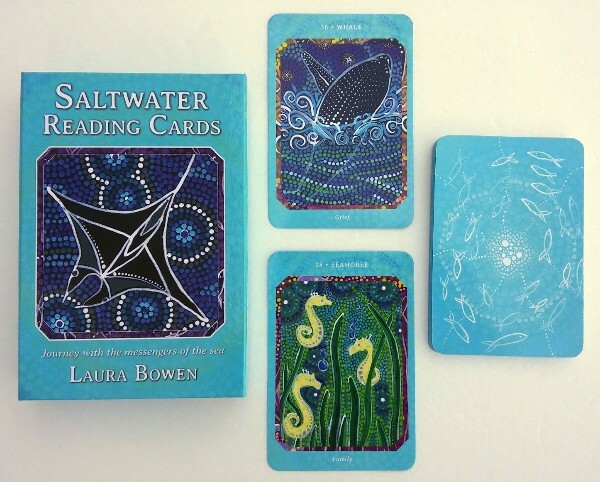 Deck: Saltwater Reading Cards, by Laura Bowen, published by Rockpool Publishing.